This year's HockeyNow Minor Hockey Players of the Year Kaiden Guhle (Alberta), left, and Justin Sourdif (B.C. ), right, were both named to the 2017 WHL Cup All-Star team. The future of the Western Hockey League is looking mighty bright. Last month the league shifted the spotlight to the next wave of talent with the WHL Cup in Calgary. The four-province tournament features some the top prospective talent the league has to offer competing on teams from British Columbia, Alberta, Manitoba and Saskatchewan. One year after falling to Alberta in overtime in the gold medal game, B.C. returned the favour. Swift Current Broncos prospect Ben King played the hero with his second goal of the tournament, finding the back of the net with a deflection from the slot to send his teammates pouring over the bench in a 4-3 victory. While Alberta managed to take the edge with a 6-2 victory over B.C. in Day 2 of the round robin, it was the boys from out west who earned the last laugh, proving offence isn’t everything. In fact, B.C. managed to rebound from an ugly 0-1-1 start after opening the tournament with a 3-2 shootout lost to eventual bronze medal winning Team Manitoba. After finding some life in a 6-0 win over Team Saskatchewan to close out the round robin, B.C. repeated the feat with a 7-0 win in the semifinal to put themselves back in the running for gold — and with a chance to redeem themselves against Alberta to boot. Alberta took an early lead on goals from Connor McClennon and last year’s HockeyNow Player of the Year (Alberta) Kaiden Guhle, but B.C. dug in their heels and pushed back. Vancouver Giants prospect, and the B.C. winner of our 2017 Player of the Year award, Justin Sourdif put the West Coast back into the contest a few minutes later, then Red Deer Rebels first round pick Tyson Phare knotted things up to close out the second. B.C.’s Raphael Pelletier and Alberta’s Jake Neighbours traded goals in the third, setting the stage for King to pull the rug out in overtime — snapping Alberta’s 16-game unbeaten streak at the tournament, dating all the way back to 2012. 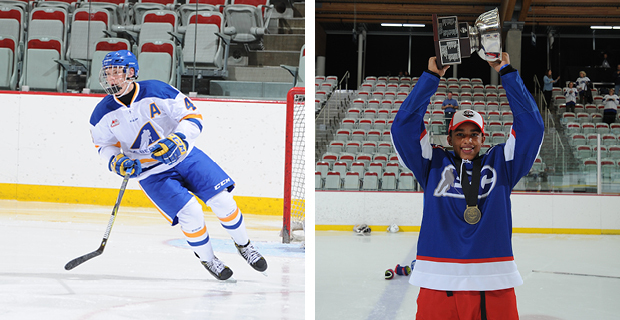 While Team Alberta ultimately settled for silver, four young players absolutely dominated the scoresheets throughout the five-day event. Kyle Crnkovic, McClennon, Guhle and Jake Neighbours finished first through fourth in tournament scoring while helping their team go undefeated all the way into overtime of the gold medal game before finally settling for silver on Ben King’s game-winner. Saskatoon Blades prospect Crnkovic dominated opposing defences, closing out his week with a tournament-best 12 points and nine assists and McClennon — a first-round bantam pick of the Kootenay Ice — followed up with six goals and four helpers. Prince Albert Raiders property and 2017 first overall bantam draft pick Guhle led all defencemen with five goals and four assists, while Neighbours — an Edmonton Oil Kings pick — added a goal and six assists. Rounding out the top five was BC forward and Neighbours’ future Oil Kings teammate Tyler Horstmann, who logged five assists in the tournament. Crnkovic, McClennon and Guhle also each earned a place on the WHL Cup all-star team. While Team Saskatchewan was forced to settle for fourth in the four-province tournament, their efforts on the ice didn’t go unnoticed — especially when it came to the blue paint. Lethbridge Hurricanes prospect and Moose Jaw product Bryan Thomson earned the title of top goaltender with a place on the WHL Cup all-star team after recording 58 saves in two round robin games before adding 17 in his team’s 4-2 bronze medal loss to Manitoba. Thomson finished the tournament with a 1-3-0-0 record, a 5.28 goals against average and an .839 save percentage. The 15-year-old netminder and second round bantam draft pick will play out the rest of his season with the Saskatchewan Midget Hockey League’s Notre Dame Argos before entering his first year of WHL eligibility next season. While he hails from Brandon, Manitoba, the Moose Jaw Warriors have taken claim to defenceman Daemon Hunt after selecting him 15th overall in the 2017 bantam draft. And that decision has been paying off for the Warriors. Hunt earned his way on the WHL Cup all-star team after demonstrating his dynamic two-way abilities as a playmaking forward through his five games at the event. The 15-year-old blue liner registered two assists at the tournament, including a fancy set-up in his team’s narrow 4-3 round robin loss to Team Alberta. Hunt found Kamloops Blazers prospect Reese Belton waiting beside the goal with a backdoor pass through traffic to open the scoring. Hunt has already made an impression at the WHL level as well. The 6-foot, 190-pound defenceman logged his first career point with an assist in Moose Jaw’s 5-2 win over the Kootenay Ice on Oct. 6.